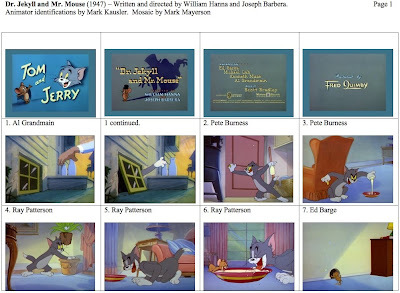 This cartoon is available on the DVD Tom and Jerry Spotlight Collection Volume 2. 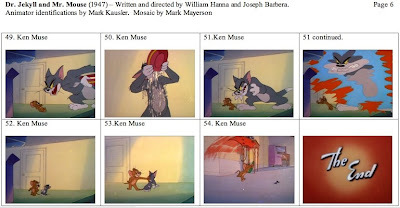 Mark Kausler's animator identifications come from his blog. Thanks for doing a Tom & Jerry mosaic! I've always had trouble identifying the MGM animators. (I see Mike Lah animated my favorite scene in Dr. Jekyll and Mr. Mouse.) I hope you'll produce more of these mosaics featuring Disney's rivals, like MGM and Warners, in the future. I'm almost positive scene 4 was animated by Burness. I could be wrong, but it just doesn't look like Patterson's work to me. 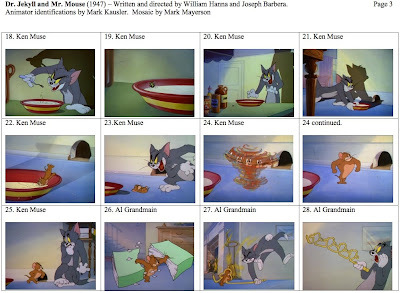 I don't see how scenes 26-29 could be done by anyone other than Ken Muse. 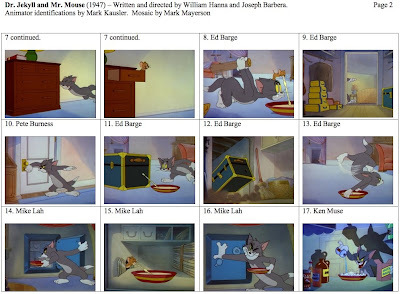 Additionally, scene 47 can't possibly be done by Barge, since that's obviously a Muse Tom. Barge's Tom had rounder ears and by 1947 had simplified Tom's chest design to two bumps as opposed to the three that Muse was still doing. What I really want to know is who exactly Irving Levine is and what did he do on "Kitty Foiled". Mike, I emailed your comment to Mark Kausler and he responded. I've put his comments in italic. Al Grandmain *was* an effects animator. "(Could be, I wasn't positive that was Al Grandmain's animation. It just looked a little too clean and the characters were a different proportion than most of Ken Muse's other scenes, these fooled me.)" The look of shock on Tom's face and the way he runs out of the scene is pure Muse. I'd stake anything on it. "(Mike is very good on the Tom and Jerry iDs. He should do a list on "Kitty Foiled.")" First of all, thanks. It's really not that hard to identify this stuff when you know what to look for and what standout quirk each animator had. 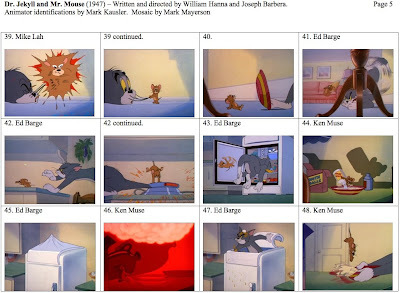 As for "Kitty Foiled"...this short looks like it's animated completely by Muse, Spence and Barge. 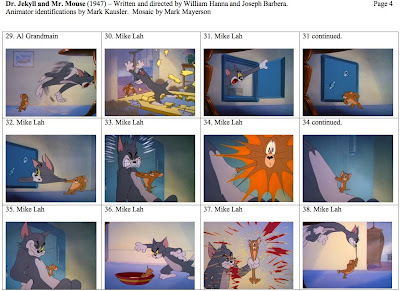 But I'm still lost on Levine's contribution to the cartoon and what animation (if any) he may have done. I could easily do an ID for this one if I had a little more information. Irving Levine's only other credit is on the Preston Blair/Mike Lah Barney Bear short THE BEAR AND THE HARE. He might have been another effects animator, as there is a lot of animated snow in that picture. Maybe Levine animated the train in KITTY FOILED? This is all speculation though. The 1940 U.S. Census shows an Irving Levine as an artist in Florida, down the street from another artist and an inker. I don't know if he worked for Fleischer in New York, but that's where he and his wife were living in 1935.